As I've mentioned once and twice I recently spent four hours in the hairdressers having my hair cut and coloured. Whist I rarely bothered with my hair in the past, my new cut and style means I've needed to pay a little more attention to styling. Thankfully I have received a number of new products recently to test and trial which have made the job fair easier. Amika is a rather funky packaged range of products from New York. I was sent the the Bombshell Blowout Spray* and Haute Mess Texture Gel* the latter of which I'll be sharing with you today. When I had short hair years ago I would use a wax that's now discontinued and with my choppier style I would need something that ensure the style was tousled and textured so I needed to find something new. Gels scare me as I'm still scarred by the 80s versions that would leave hair in a crisp solid mess. And of course no one wants sticky fingers. Ibliphica Oil and Grapefruit add flexibility to your hair whilst still aiding your styling. You can use on damp or dry hair, damp being my preference and it works a treat. Safe for colour treated hair and free of parabens and the like this is a kind product that I now use regularly. And the stickiest - I can't believe it but there's none of that left on hands once it's run through your hair. I would moan regularly about how greasy my hair was but I never fully appreciated how the lack of colour treatments led to it's good condition and natural oils. There are of course plus sides to my hair being on the dryer side now and that is of course experiencing the pleasure of second and third day hair - a complete new concept to me. I still want to retain the appearance of healthy hair so a luxurious product I've been using to achieve that is the Nexxus Infinite Nourishing Hair Oil*. Infused with oils including African Marula Oil which is renowned for its healing properties this is a nourishing product that has saved my hair. I've used this more commonly on dry hair to tame any obvious frizz caused from my hair dryer and make things appear smoother and sleek without banishing volume and texture. Revlon UNIQ ONE 10-in-1 Coconut Fragrance Hair Treatment* has been part of my hair line up for some time and apart it's wonderful smell it's a great product to use that protects against heat, stops detangling and prevents split ends among its many other claims. I think I saw on someones Snapchat or similar that it's popping up in one of the beauty boxes this month so if you'll be pleased with this product. I simply apply after I've washed my hair and I found even in my brunette days that it wouldn't leave any heaviness in my hair. 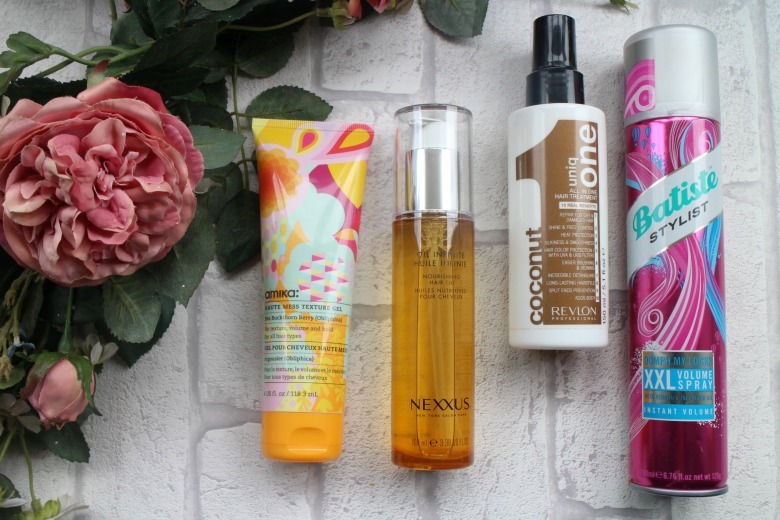 I'm a big fan of the Batiste Dry Shampoo range (even more so these days as I don't have to wash hair so frequently) so I was excited to see how their new styling range would work for me. The stand out product for me, and for only a few pounds is Batiste Oomph My Locks XXL Volume*, a worthy competitor to it's higher end counterparts. In fact everyone I talk to mentions this product so I can report back that it's not just me. A blend on Keratin and Inca Inchi oil help to strengthen and care for your hair whilst giving a backcomb in a bottle so you can avoid tugging at hair with a comb. Once I have styled my hair I apply to the roots and then have a good massage to create hair that no longer sits flat to my head. As someone who isn't adept with hairstyling products that help me achieve the look I want with ease and speed make such a difference. My new hairdo has led to quite a few new products being tested recently which some additional favourites I'll be sharing with you soon so do stay tuned. Ooooh the Revlon UNIQ ONE product sounds like exactly what I need. I've got long thick brunette hair, but I've been stripping the colour out of the ends so it really needs some extra nourishment. Same, although with the colouring and style I've had done I'm having to be a little more attentive.